I obviously had to resize these down because they had to fit on my blog template, but at larger form, these orbs are much more noticeable. 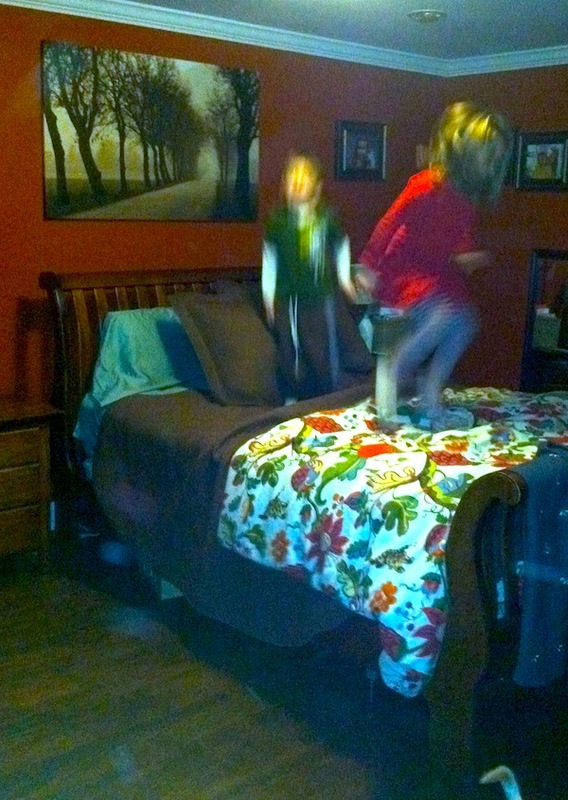 I never intended to post these pictures of my kids jumping on my bed. This was just for our personal collection – but as I took the first picture, something shot across the lens. I thought it was a bug and tried to find it. But I couldn’t. Then as I was taking pictures, I looked at my phone to see the results. That’s when I saw these white circles. I told Bill I thought they were ghost orbs that we were photographing. That darn psychic has ruined me! I am so paranoid now! I guess it could have been dust, right? I messed with the lighting and coloring of the pictures on my computer so you can see the white circles better. I wasn’t moving. 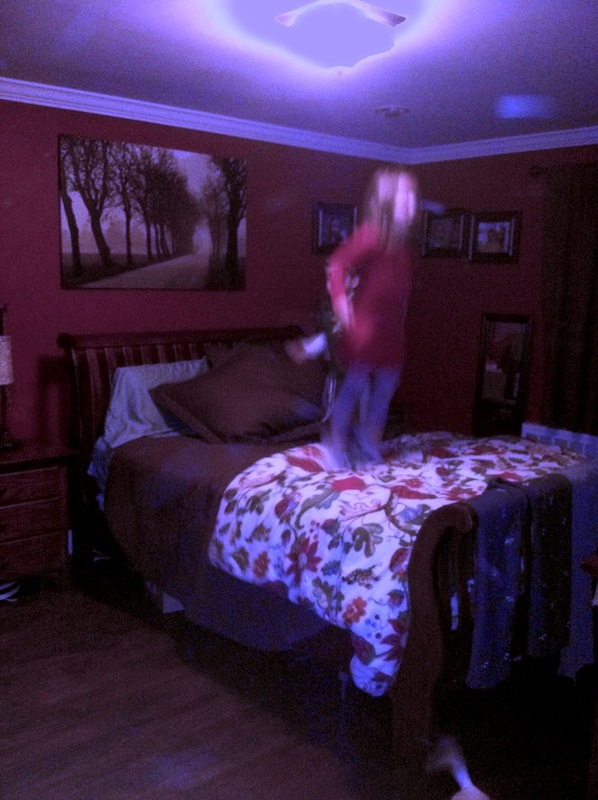 I was standing in the same position and the orbs in the photos are in different positions each time. It couldn’t be the reflection of the light right? Because wouldn’t that just repeat the same position over and over again? I don’t know about any of this – I just need a second opinion because I am fr-eaking OUT. Do you believe in this stuff? Do you think these are spirit orbs in my pictures? Dust? WHAT???? 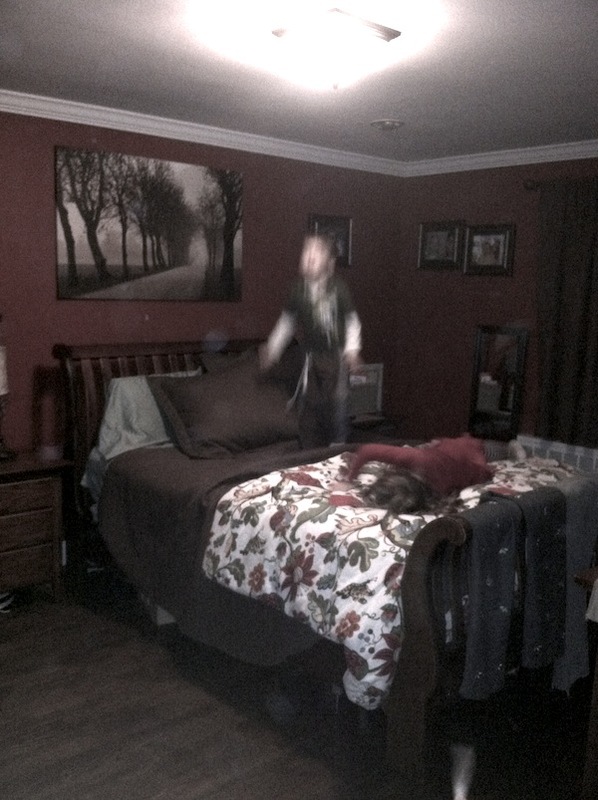 Ghost orbs for sure! I am a firm believer in it! AWESOME! oh my gosh – dottie you are killing me! No worries – it’s not the next American Horror Story. 🙂 I’ve had this happen, too. 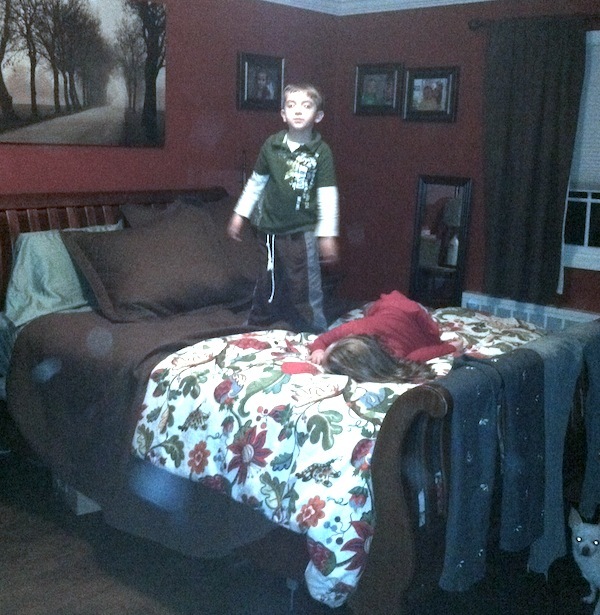 The kids were whipping up dust from jumping on the bed and your shutter speed wasn’t fast enough. Sometimes you’ll also catch a glare if you have a lens filter with a blemish. With the right exposure, you probably wouldn’t have seen anything. LOL!!! haven’t seen that show – but it sounds like it’s a GOOD THING I’m not living it 🙂 thank u! Guess where I see them? In our video baby monitor floating around! I’ve heard it is just a light thing. There IS supposed to be a tiny white dog in the lower right corner, right? It’s not a….GHOST DOG??? I’m just messing with you, Vera! I would think it was weird if my photos had phantom circles in them too. My older sons friend is Native American and one night they were out on the Indian Reservation taking pics, and each pic came back with multiple light streams and orbs through out them. It only happened while they took pics on the Reservation, and has never happened since. Being that Native Americans are very spiritual people, I truly believe that they were surrounded by spirits that night. I also think there was definitely something in that room with you and your children…especially if you saw it with your own eyes.